While technically an inland hypersaline lake, the Dead Sea is definitely one of the most famous 'seas' of the world, for its incredible buoyancy, as well for its ancient significance and artifacts found in the area (the Dead Sea Scrolls might ring a bell). It is the second saltiest body of water in the world, and the lake’s depression marks the lowest point in the world. A robust tourist industry has sprung up around it, including several luxury resorts that take advantage of the Dead Sea’s 'miracle' mud, which is full of antioxidants for the skin. Many travellers come to relax and experience the restorative properties of the Dead Sea and its surrounding natural features at their leisure. Hopping into the water may only take a few minutes, but there are other sights in the area worth sticking around for. Dead Sea visitors can expect to see surreal salt formations along the beach, which can be really painful to handle in bare feet – always wear sandals or aquatic shoes, even in the water. Avoid splashing, and stick to floating. As its name implies, nothing lives in this ultra-salty lake, so rest easy about fish or other animals creeping up on you from below. Besides salt, the water contains a rich mix of minerals, such as bromium, potassium, and magnesium, which are harvested by various factories in the area. Keep in mind that you don’t actually need to pay to get in the water – just walk farther away from the Amman Touristic Beach, and pop in for a dip. The private beaches do have their advantages, including freshwater showers, mud pots, and bottled water – they also have lifeguards. 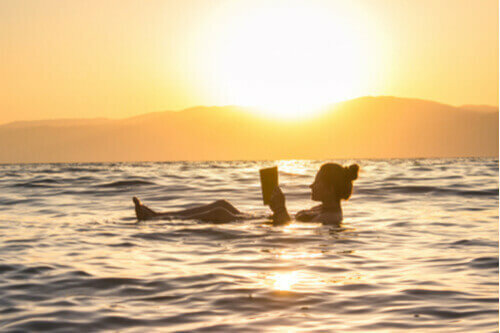 When one visits the Dead Sea, the must-do expectation is to take an obligatory photo while floating in the water, reading a book or newspaper. Be sure to stay on your back, and keep your face well away from the water – it can be extremely painful if it gets in your eyes, and the salinity is brutal on sunburned, cut, or freshly-shaven skin. Swimmers will find the water to be quite oily or greasy due to the high salt content – this is definitely not a sea for regular recreational swimming. While the Dead Sea is definitely the star of the show here, there are other things to do in the area, including side trips to the historic city of Madaba, the baptism site of St. John the Baptist, the holy site of Mount Nebo, and the nature reserve in Wadi Mujib. Visit the nearby Dead Sea Panoramic Complex, which contains the Dead Sea Museum, a one-stop-shop for information about the area, its people and relics, and environmental conservation efforts. The Hammamat Ma’in (or Ma’in Hot Springs) are also close by, and offer a distinctly different swimming experience – the series of hot thermal springs is like being in a steamy natural sauna, complete with a cave. It’s considered a therapeutic destination for people with respiratory problems, chronic pain, and other maladies.